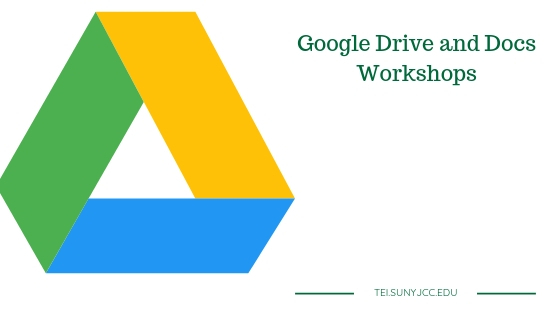 This afternoon, we offered two workshops for the JCC community: Google Drive and Google Docs. The workshops were conducted in person from the Jamestown Campus but shared with Google Hangout on Air to the Olean campus and the rest of the world. Here is more about those workshops. Finding files shared with you. Are you looking for collaborative ways to share and work on documents for your classroom? Google Docs are saved in the cloud, specifically, in Google Drive, and can be accessed from a phone, tablet, or computer with or without an Internet connection. Google Docs can be extended with third-party add-ons. Exporting and importing documents from other file types. Publishing documents to the Web. Adding comments and suggested edits. I hope you found the presentation useful. If you want to know more, please contact a member of the TEI team. #SUNYCIT: Yikes! No More Ignoring Google!